Now that i have your full attention, Greetings! I’ve been so busy lately thinking up new material, taking Grandma places, entertaining the little one, and saving Singapore from a deadly armored robot racoon…. ((Deep Breath)) that I have had hardly anytime what so ever to write an article. After watching that abortion Human Centipede 2, I found myself on a search for a good movie. Luckily, I found one! Really I had been meaning to catch this flick for quite some time. Since last Halloween Horror Nights to be exact. Most of you regular readers may recall it was featured as a haunted house at last years event (For those of you that are clueless, you probably just happened by this site. THAT’S OK!! But do be a doll and go back and read the review for Halloween Horror Nights 21….and for the love of Cthulhu, like it and subscribe!!!) Needless to say, I finally found time to watch it. It’s actually rather good. Normally, I find myself spouting off rants on how Hollywood needs to stop using the previous round of horror movies as a crutch instead of justing relying on their own talent. With this movie though…well if Hollywood would follow suit with this kind of treatment…I would like it very much. This prequel to John Carpenter’s masterful remake was a true delight. With that said, let’s dig into this review! As good as the HHN version of this movie was, I needed to see it with my own eyes. It was a damn shame I didn’t get to see it while we were in Orlando for HHN 21. I would have loved to do this review way back when. But time being what it is, there never does seem to be enough. So was the wait really worth it? Yes…Yes I feel it was. I now also see what others were saying some of the problems with the house were as well, but I’m not here to talk about HHN…thats for another time. The Thing offers some fantastic visuals along with a great storyline that meshes well with the source material. Normally, when dealing with a classic like John Carpenters version, it’s very hard to come up with anything new and hold true to the original. Not a problem for this installment. Not only does it stay within the confines of the material, but it expands a little answering some unanswered questions from the original. The great thing is, John carpenter sign’s off on it meaning that it is all cannon to the story. Pretty sweet eh? My favorite part of horror movies are the visual effects. While I did enjoy the use of CGI for the creatures in this film, I also think that they relied a little to heavy on it. Supposedly they did use practical pieces, but they glamoured it up a little too much with effects. You really can’t see where most of the practical creatures are! I know that it is an unfortunate side effect of the computer driven world we live in…I get that. I just wish most directors wouldn’t underestimate the use of creature actors and well placed puppeteer. I don’t want you to think that I was completely unimpressed, but I felt they could have been a little better. It would also be terrible of me, and a crime, if i didn’t mention the set design (it’s included in visual effect damn it!) The level of detail with the recreation of the Norwegian station is just staggering. As the events play out, you really start to see it take shape into the disaster that MacReady and crew explore. Pay close attention to everything that happens and then watch the original. It is sure to tickle your fanboy or girl funny bone! There is a point in the film when you get to the familiar scenario of needing to find out who is a Thing and who is human. Well they go with the set up of doing blood tests just like in John Carpenter’s. Similar to the other, the scientific approach is ruined in the form of the lab being destroyed. This is the bait, here’s the switch! Just when you think they are going to go for the ol’ “Heated wire to the blood trick” you get your added cannon. Earlier in the movie, the main protagonist Kate Lloyd (Mary Elizabeth Winstead), finds some fillings in the bathroom where a Thing took someone over. She comes to the realization that the alien cannot replicate inorganic matter. So she tells everyone to open their mouth so she can look for fillings. Naturally, it’s not perfect. But it provides the perfect set up for a familiar scene with a new twist. My verdict? I give it 4 Top Hats out of 5. The movie presents with a nice story, good acting, pretty good effects, and some epic visuals that bring back fond memories. Well that’s all for now my Freaky Darlings. Stay tuned for more madness to come. This entry was posted on May 6, 2012 by malicepsychotik. It was filed under Reviews! 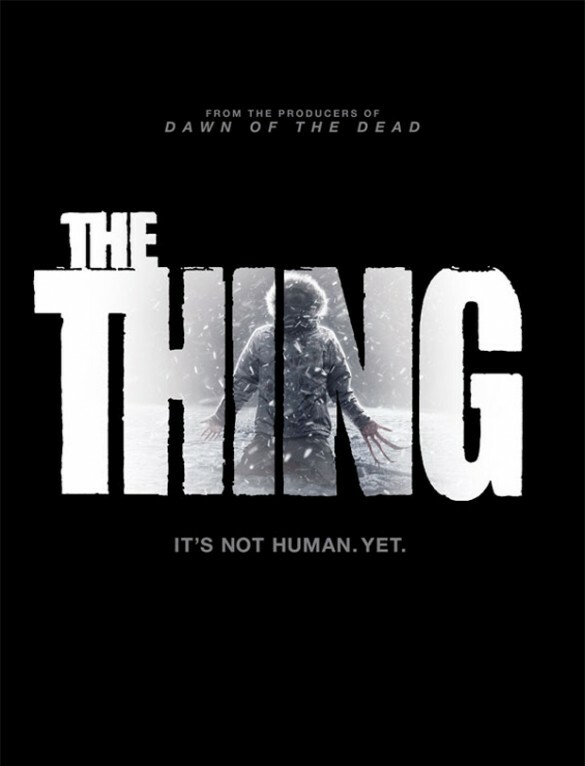 and was tagged with Horror, john carpenter, mary elizabeth winstead, The Thing.